Continuing in the pate a choux chapter, we come to éclairs. They use a similar dough as the cream puffs, with slightly different proportions, to make a stiffer dough. Since the éclairs are piped freehand, the dough must be stiffer than the cream puffs, which are molded. At Bouchon, the éclairs are piped using a French star tip to form grooves in the dough, which let them expand evenly while baking. Our bakers could choose to make any of three different varieties: chocolate, lime coconut, or dulce de leche. While the chocolate éclairs are the most traditional, the other two variations are more modern and certainly more complex and delicious. I had intended this week to make both the chocolate and dulce de leche éclairs, but time got the better of me. It's a shame, too, since I have a wonderful jar of dulce de leche that I brought back from my recent trip to Argentina. Perhaps I'll tackle that one another day. But on to the chocolate éclairs. I made the dough, which was much like the cream puffs. Chilled the dough before piping. It was still a little looser than I thought it should have been, and was difficult to pipe evenly. I baked them for exactly as long as the book instructed, and they turned out great, hollow and dry inside. They may have browned a bit too much. Where I hadn't piped them properly, the middles were too thin and didn't rise properly. While they cooled, I made the chocolate pastry cream. It was very similar to the vanilla pastry cream, which I have become better and better at making. When it was finished, I remarked that it looked just like chocolate pudding. After a quick search online, I determined that they are indeed extremely similar, the only difference being the thickening agent- eggs or flour. As this recipe uses both, it is much like a pudding, so I felt more comfortable eating it by the spoonful. To make the chocolate glaze, the recipe calls for something called neutral glaze. There is no explanation of what this is in the book, so I again turned to the Internet. It's used mostly in glazing fruit tarts, a sweet and glossy finish. I couldn't find any locally, and didn't have time to order it online, so I looked for a recipe to make it myself. To make it I needed NH pectin, which was another ingredient I couldn't acquire, so I gave up. I instead adapted the glaze recipe with the ganache recipe earlier in the book, adding glucose and trimoline to the glaze. It wasn't nearly thin or glossy enough, but it would work. Filling the éclairs was difficult. The pastry cream was too thick, or I hadn't let it come to room temp enough, because it was difficult to pipe. Next time I would lighten it with some whipped cream. I dipped them in the glaze and it was thick but not glossy, and didn't go on smoothly. Overall, very delicious, but needs some work. I still prefer to eat the plain choux right out of the oven! 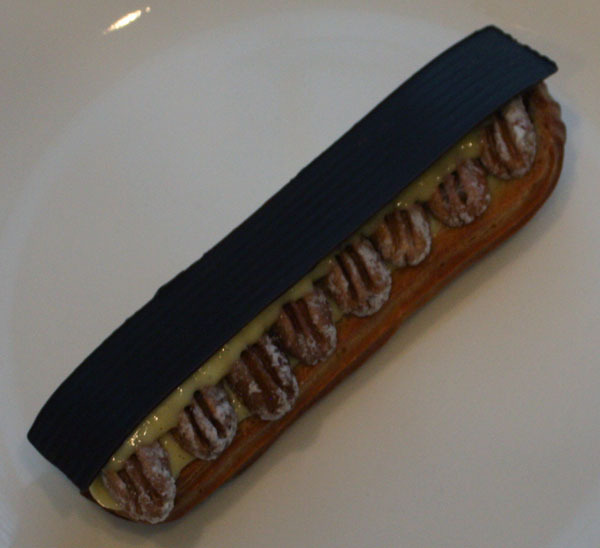 I took on this non-traditional flavor of eclair. First the dough. I didn't have the correct French star tip for piping. Mine has more pronounced grooves so the resulting eclair pastries had protruding ridges and it was a bit difficult baking with the unevenness of the surface. This then translated to not a quite smooth icing finish. All minor things though because the eclairs tasted really good and with the finishing of toasted coconut, they looked rather nice as well. A couple of notes on the other components. The lime curd is definitely tart, as with the lemon curd recipe in the book. I like it and it works well with the sweet icing top. I didn't have pouring fondant so I just made sure my powdered sugar/water combination was pretty thick so it wouldn't drip down the sides. I also only had flaked coconut instead of shredded but I highly recommend the shredded because the texture is nicer when eating the eclair. 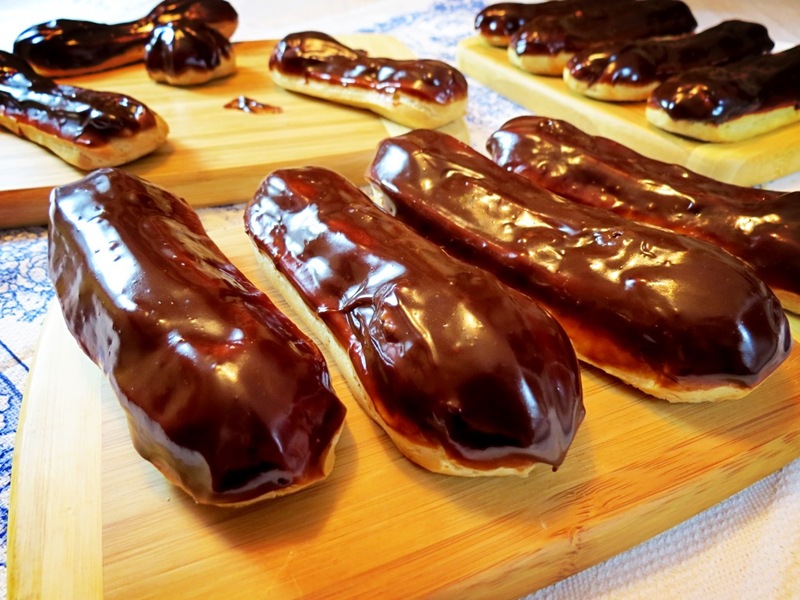 A fun twist on the classic French eclair! I might try lemon next time. I had planned to make the chocolate eclairs, but discovered too late that I needed to buy neutral glaze online. Dulce de leche eclairs, although they involved more steps, seemed do-able and became my Plan B.
Dulce de Leche: I'd never made dulce de leche before, partly because I was leery of "poaching" an unopened can of sweetened condensed milk. But if Thomas and Sebastien say to do it, my worries must be unfounded - right? My worries returned at about the 3-hour mark, when the outside of the can started to rust, turning the water a bit brown. I'm also not exactly thrilled that the bottom of my expensive saucepan now has a rust circle on it, which I'm hoping will fade away. But when I opened the can, the contents were perfect - and perfectly delicious. Candied Pecans: Easy, and the recipe makes a lot. Caramelia Rectangles: I didn't search for the special Valrhona Caramelia called for, and just used milk chocolate I had on hand. I also used a technique I learned from "Bittersweet" by Alice Medrich to make the chocolate strips. I used strips of plastic shelf liner cut to size. It's thicker than the acetate called for, and is easily available. I spread a medium-thick layer of chocolate on each strip, let it dry a bit, then refrigerated it. The plastic peeled right off the chilled chocolate. Diplomat Cream: I did something wrong, because it wasn't as stiff as it should have been. Conclusion: Many steps, but an impressive and delicious result. I'm already thinking of tackling the other flavors.